Sharp sues Hisense for "shoddily" made TVs | What Hi-Fi? Sharp claims Hisense is putting its name on poorly made TVs, which risks destroying the Sharp brand. Not all Sharp televisions are made by Sharp. A licensing deal made between Sharp and Hisense in 2015, and set to last until 2020, means that Hisense can badge televisions with the Sharp name. But that deal could be in jeopardy after Sharp claimed that these TVs aren't up to scratch. Sharp's legal papers claim that Hisense has broken US rules on electromagnetic emissions and made fraudulent claims about the picture quality of the TV sets. 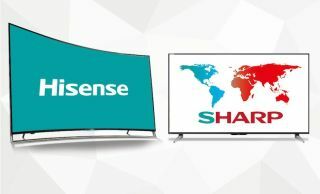 Hisense strongly denies the accusations and says that it will "continue to manufacture and sell quality televisions under the Sharp brand", despite Sharp claiming the deal could destroy the Sharp brand. Sharp signed the deal with Hisense in 2015 when it was in financial difficulty. Since then, the Taiwanese electronics company Foxconn has purchased a controlling stake in the company. Following a cash injection from Foxconn, it seems Sharp now wants to regain control of the brand name in the United States - and this legal action could be the first step. Sharp launched more than 50 HD and 4K TV ranges at the IFA trade show in September 2016, though we've yet to see any review samples. Hisense said that "Sharp’s attempt to terminate the agreement is of no effect", and "categorically" denied all Sharp's claims.